Know all Men by these Presents, that we Peter Pickering of Liverpool in the County of Lancaster and Diocese of Chester, Merchant, William Pickering of Liverpool aforesaid, Merchant, and William Tomlinson of Liverpool, gentleman.
. . . "The condition of this obligation is such, at the above bounden Peter Pickering (1781-1865) one of lawful sons and one of the next of kin, no parent being living, and administrator of all and singular the goods, chattels, and credits of John Pickering (1744-1814), late of Beach, near Frodsham in the County of Chester in the Diocese of Chester, Corn Dealer, deceased . . . "
" . . . 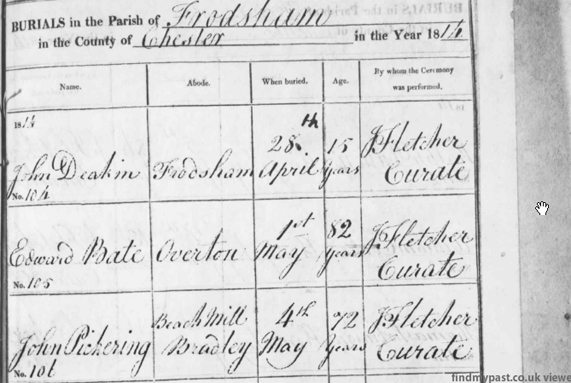 The fourth day of March in the year 1815 Peter Pickering, within named took the usual oath of an administrator in common form, and further made oath that the personal Estates and Effects of his Father John Pickering deceased, did not amount to the sum of two hundred pounds. 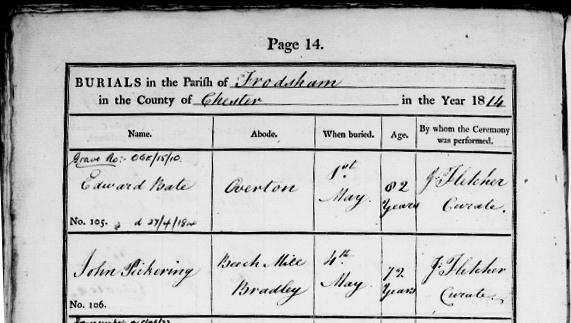 John Pickering died intestate in the month of May 1814 and the administrator was not in England at that time nor until about the middle of September 1814." 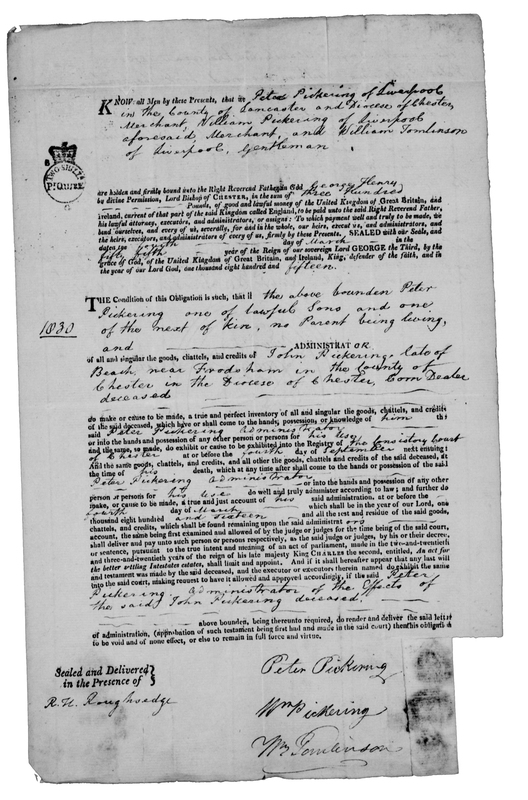 The will you referred to is actually a bond of administration granted to Peter and William Pickering, so that they could administer their father’s estate; this indicates that John died without leaving a will, or at least none could be found. The seals by Peter’s and William’s names are completely covered front and back, because the paper has become folded around and stuck over both seals; this must have happened when the wax was still fresh, and as a result only the outline can be seen through the back of the paper. No detail whatsoever is distinguishable, and unfortunately we cannot reveal the seal without causing damage to the document.